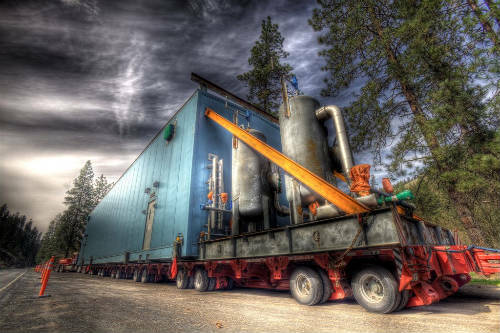 In what was purported to be a “test” shipment, Exxon’s first attempt to transport a tar sands megaload shipment through the scenic Lolo Pass of Idaho and Montana has proven to be a tragicomedy. 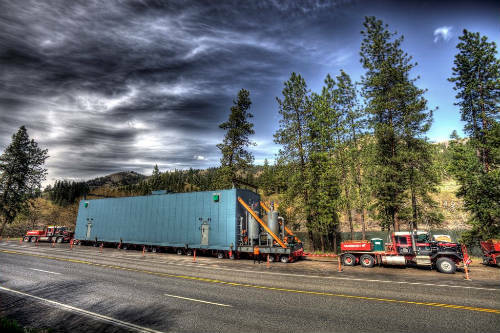 After Montana and Idaho Transportation Departments granted Exxon permission to conduct a demonstration shipment – for what has been reported as some of the largest loads to ever travel on the Idaho highway system – an oversized module left Lewiston, Idaho Monday night (April 11th). Exxon planned for the shipment to travel along the 182-mile, windy and narrow Lolo Pass (US Highway 12) where it would traverse the historical Bitterroot Divide made famous by the Lewis and Clark Expedition, and then ultimately make its way north through the state of Montana onward to Exxon’s tar sands operations in Alberta, Canada. But the best laid plans by Exxon were soon cut short by a series of mishaps. Shortly after disembarking in Lewiston, the shipment struck a tree, splitting a gigantic branch 10 inches in diameter, by 20 feet long. But that was just the beginning, the shipment continued on and later in the night, around 1:30 AM, the megaload severed a utility pole guy wire. This set forth a chain of events where the pole attached to the guy wire broke, striking an adjacent high voltage power line which then shorted. According to the Idaho Transportation Department and local observers, the end result was that the small towns of Pierce and Weippe were left without power for over five hours, impacting over 1,500 residents. Needless to say, Highway 12 was also closed until the situation could be assessed by the local utility company. The shipment has been since temporarily suspended, parked idly by the side of the Clearwater River (reportedly, there are tentative plans to resume the shipment starting as early as Thursday night, April 14 Update #1: the shipment will not resume until Monday, April 18th at the earliest. Exxon and the shipper are reportedly working on the accident investigation and potential corrective measures). This test shipment is part of a larger effort by Exxon and its subsidiary, Imperial Oil, to ship and transport at least 200 oversized tar sands mining modules overland through Idaho and Montana. These modules, constructed and shipped in from South Korea, vary in size, the largest being over 24 feet wide, 196 feet long, and 30 feet tall. Each module weighs approximately 300,000 pounds standing alone. For land transport, the modules will be loaded on trucks and the entire vehicle configuration weighs approximately 500,000 pounds. The reason for all of this attention is that these events are taking place high-up on the Rockies, at Lolo Pass, which connects Idaho and Montana in one of the most isolated and scenic landscapes to be found in America. But unfortunately, the ecological, recreational, and scenic qualities of this treasured area may become forfeited to Exxon. While Exxon worked mostly in secret with officials from Idaho and Montana to bring this scheme to life, local residents, regional conservations groups, and NRDC’s members and activists have repeatedly voiced our opposition to this harebrained proposal. Furthermore, far from being the “one-off” proposition that Exxon claims these 200 shipments are going to be, inordinate evidence shows that the oil giant is potentially planning to ship over one thousand oversized shipments through Lolo Pass, creating a de facto industrial “high-and-wide” corridor in the region. This brings us back to the week’s events. Think about it for a minute, this was a “test” shipment. It took place under presumably ideal conditions. And given the amount of attention that hinged on this one shipment, one would assume that extra diligence was applied to the process of shipping this insanely large module. Incredulously, representatives from the state of Idaho and Exxon claim not to have known how the accident occurred. Really? Could it have anything to do with the 2,500-ton building Exxon was trying to maneuver through a gap so small, that there were only a few inches to spare on each side of the highway (at best)? 3) The local residents of Idaho and Montana are being required to sacrifice a way of life just so that Exxon can add a few more dollars to their billions of profits. And irrespective of these three important points, much of what Exxon is proposing boils down to this: shipping hundreds of preconstructed modules that are bigger than many buildings, on one of the most isolated, exposed, and meandering mountain passes in the contiguous United States is logistically preposterous. The engineering challenges alone make this unique place in the world the utterly wrong place for such an endeavor. Note: at this time, attorneys for Missoula County in Montana and a number of the regional conservation groups have filed a legal challenge asking the courts to issue a temporary restraining in order to stop this shipment and others like it from entering into Montana. We will certainly follow these events closely. UPDATE #2: In what is significant news, the Nez Perce of Idaho and Montana's Confederated Salish and Kootenai Tribes have intervened in the lawsuit against the Montana Department of Transportation’s decision to allow Exxon’s oversized shipments. The respective tribes have raised concerns in the past that the proposed route violates treaty rights while unduly impacting cultural and environmental resources, among other issues. UPDATE #3: On April 18, a State of Montana judge issued a temporary restraining order halting ongoing highway construction that would be necessary in order to facilitate Exxon's plans to ship over 200 megaloads. A more detailed report is posted here: "Montana judge halts highway construction for "Megaload" Exxon shipments"